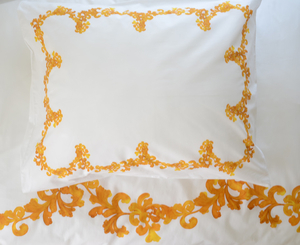 Duvet cover and pillowcase with ornamental edging in romantic style. Digital print.. Available in the colors Astral blue (royal blue) and Tupelo honey (golden yellow). The bed linen is 100% Egyptian cotton percale. Our bed linen is made of the finest cotton in the world, long-fiber combed cotton from Egypt. It has 300/300 threads per square inch which gives a cotton fabric with excellent softness, and longevity.